From professional piano performance to simply discovering the joy of music for the first time, the CVP-709 is truly a family musical entertainment center. It’s the first CVP Clavinova featuring not one, but TWO world-class grand pianos (Yamaha CFX and Bösendorfer Imperial) inside one digital piano. The Piano Room feature has been expanded to include more pianos and a new Session Mode with a built-in recording studio for capturing and sharing your music. In addition to the NWX (Natural Wood X) keyboard with synthetic ivory keytops, the 88-key Linear Graded Hammer action dedicates a unique weight for each key over the entire keyboard. Each key also features carefully-adjusted counterweights for improved playability when playing pianissimo and better key return in rapid passages. The NWX keyboard also features an escapement mechanism that reproduces the feel of an acoustic piano as it goes through the let-off and drop of the hammer when a key is played very softly. Beyond the CVP-709’s piano performance is a wealth of interactive musical features capable of making music fun for anyone regardless of skill level or experience. NWX (Natural Wood X) keyboard action with escapement and synthetic ebony & ivory keytops utilize specially dried wood that was specifically chosen to give you the same response and feel as that of a grand piano keyboard. The color touch screen allows you to easily see the state of Voice and Style assignments and quickly access and adjust a wealth of features and settings. Audio Styles feature audio recordings of drum and percussion parts played by top session players, for authentic groove and ambience. Follow Lights-orchestrated song files use Guide Lamps that illuminate over the right keys to teach you classic melodies at any tempo. You Are the Artist series software gives you the in-band experience to perform music by superstar artists like Adele, Coldplay and Taylor Swift! Super Articulation 2 (SA2) Voices allow the player to get realistic expressive nuances of non-keyboard instruments, such as a flute or guitar, both automatically and with the use of the two switches. Piano Room with Session Mode brings you back to the basics. Select a piano and choose the type of room you’re in, and even invite a small ensemble along to play with you. USA Edition adds valuable content to your Clavinova CVP purchased in the USA, including Voices, Styles, Songs, Style Guides and much more. Record and play back performances in the popular, space-saving MP3 format. Conveniently share your music with friends and family online or burn a CD. Style Recommender quickly finds suitable accompaniments based what you play on the keyboard. You can play the piano, pound out a drum beat or just tap a simple rhythm pattern on one key. The Clavinova narrows hundreds of Styles down to the eight best matches so you can start making music fast. Voice Guide is a spoken tour of the Clavinova panel, allowing you to press the buttons to learn about what they are and what they do. Pro-quality background singers put you center stage at your in-home Karaoke party. You sing a song and Yamaha’s latest VH2 (Vocal Harmony 2) chip does the rest. Performance Assistant Technology (P.A.T.) lets you focus on playing the rhythms while the instrument worries about playing the right notes of MIDI songs. 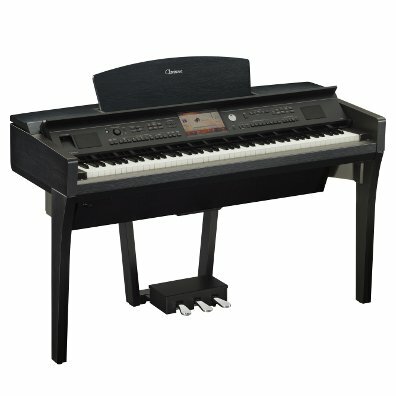 The Clavinova 5-year, in-home warranty means that if your Clavinova has a defect or malfunction, Yamaha will send a technician to your home to assess and repair your instrument. It’s rare that this is necessary due to the high-quality standards of Yamaha!